The software needs the observer's position (longitude, latitude, altitude above sea level) and optionally accounts for atmospheric refraction. Very precise algorithms are used for the computation of the sun position, but local atmospheric conditions can affect the actual values. Exceptionally, the algorithm might not converge for very specific combinations of time and observer's location, but this limitation should not be problem for most of the users. It can output either data tables or graphs. SunAzimuth shows times of sunrise and sunset, as well as sun azimuth at at sunrise and sunset. Values for 12/08/2007 at 0.20 km height. column 1 is the day (DD/MM/YYYY). column 2 is the sunrise time. column 3 is the sunrise azimuth. column 4 is the sunset time. column 5 is the sunset azimuth. Values between 01/08/2007 and 10/08/2007 at 0.20 km height. Column 1  is the day (DD/MM/YYYY). Column 2  is the sunrise time. Column 3  is the sunrise azimuth. Column 4  is the sunset time. Column 5  is the sunset azimuth. 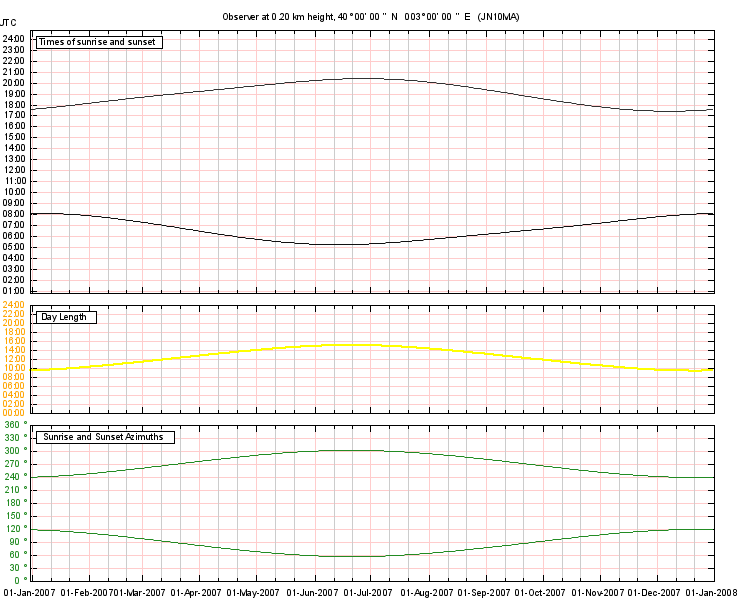 SunAzimuth can generate a single image file with three different plots. The x-axis corresponds to the days. The upper plot contains the sunrise and sunset times. The middle plot contains the lengths of days, from sunrise to sunset. The lower plot contains the sunrise and sunset azimuths. The x-axis corresponds to the days. The gray lines are the UTC sunrise/sunset times. 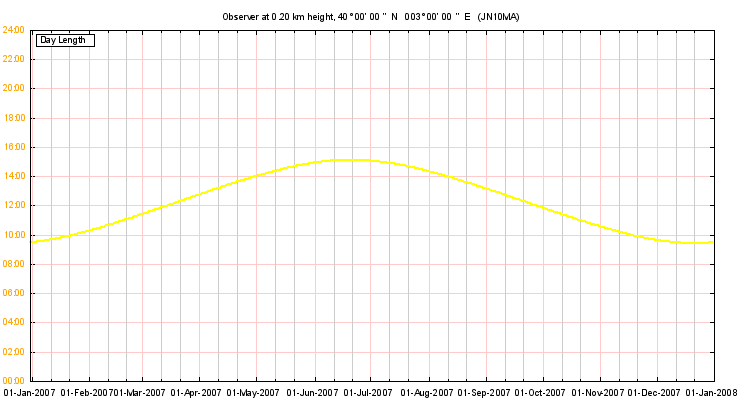 The yellow line correspond to day length from sunrise to sunset. 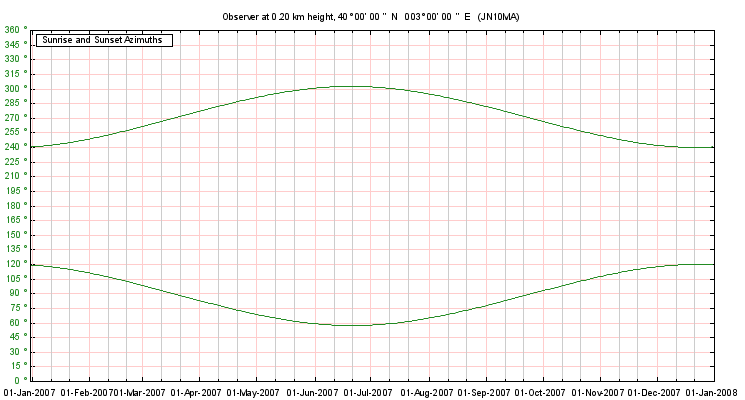 The green lines correspond to sun azimuth at sunrise and sunset. SunAzimuth has been developped in C# under MonoDevelop 2.0. It can also be compiled under Visual Studio Express 2010. It has been tested under Linux Ubuntu 9.10/Mono 2.4.2.3, and under Windows XP/.NET 2.0.
either Mono 2.4 or above, available at: Mono. Mono 2.4 or above, available at: Mono. calculation. Default is the current day. Format is DDMMYYYY (e.g. 12012006 for 12 January 2006). start       Start day for several days calculations. end         End day for several days calculations. location in degrees. String representations are accepted. for which the sun positions are calculated. between two computations. Default is 1.
norefract   Disable accounting for atmospheric refraction effect. extended    Shows full date and time (dd MMM YYYY HH:MM:SS). mysql       Shows full date and time in mysql format (YYYYMMddHHMMSS). fromsouth   Measure azimuth from south, westward positive. 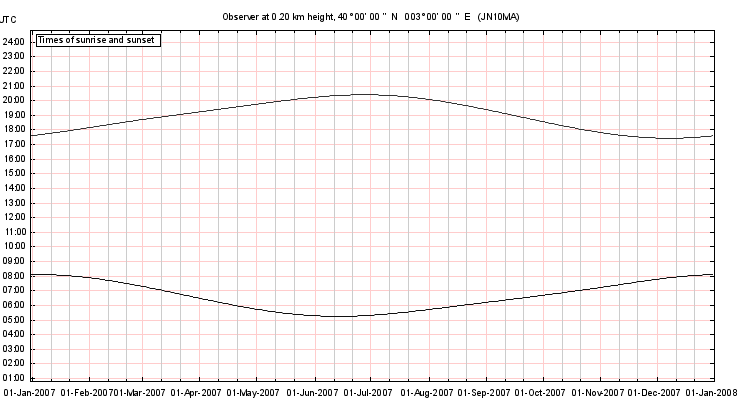 By default azimuth is measured from north, eastward positive. on Windows platforms [Program Files Directory]\gnuplot\bin\wgnuplot.exe. graph       Path to the png file that will be created. set to null if the image is to be sent to stdout. height      height of the png image, in pixels. Default is 400.
width       width of the png image, in pixels. Default is 745.
graphtimes  Path to the Times png file that will be created. heighttimes height of the Times png image, in pixels. Default is 400.
widthtimes  width of the Times png image, in pixels. Default is 745.
graphdaylen Path to the  Day Lengths png file that will be created. heightdaylen height of the  Day Lengths png image, in pixels. Default is 400.
widthdaylen width of the Day Lengths png image, in pixels. Default is 745.
graphaz     Path to the Azimuths png file that will be created. Plot contains sun azimuths at sunrise and sunset. heightaz    height of the Azimuths png image, in pixels. Default is 400.
widthaz     width of the Azimuths png image, in pixels. Default is 745.